Of all the people you’d least expect to come out with this forward-thinking take on the Giants’ season, it’s Pat Shurmur. 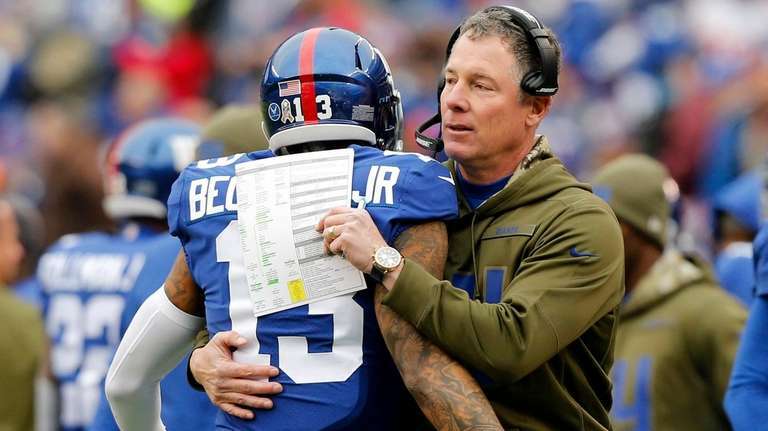 But after the Giants exploded for five touchdowns in a 38-35 win over the Bucs, giving the team a second straight win for the first time in nearly two years, Shurmur was the one who provided some oxygen to the team’s flickering hopes of remaining relevant the rest of the season. Yes, even at 3-7, there is at least a chance. Especially in a division as weak as the NFC East. When I asked Shurmur after the game if he was mindful of the fact that the Redskins are 6-4, the Cowboys are 5-5 and the Eagles are 4-6, and that the Giants now are three games out of first, I expected the usual line about not thinking that far ahead. After all, it’s what Shurmur has done virtually the entire season. This time, he not only talked about the possibilities, he fanned the flames. But he finished with the kind of statement that ought to hearten a team that still is desperate as it tries to recover from a 1-7 start. Look, Shurmur’s right about the “long way to go” part. When you’re 1-7, you leave yourself little to no margin for error. And even after two straight wins, the high-wire act will continue the rest of the way. Just finishing at .500 would require a 7-1 record in the second half of the season. Which means the odds of being in the playoff race in late December remain remote. • The Redskins lost quarterback Alex Smith on Sunday to a season-ending leg injury. • The Cowboys hardly are playing championship football. • The defending Super Bowl champion Eagles are only a game ahead of the Giants. Suddenly, Eagles-Giants next Sunday has NFC East implications. That’s not something you would have thought two weeks ago. Yes, the Giants are three games back with only six to play, and yes, they still have issues. The defense has played well in spots, and six interceptions in the last two games — including a pick-6 against the Bucs — have been a plus. But they allowed Jameis Winston to come off the bench and put together four touchdown drives to make this game closer than it should have been. And it’s still too soon to know if Eli Manning is all the way back after a series of disconcerting performances during the first half of the season. He was terrific on Sunday, albeit against a weak defense, completing 17 of 18 passes for 231 yards and two touchdowns for a nearly perfect 155.8 rating. Saquon Barkley provided even more hope with a career-best 142 rushing yards, two rushing touchdowns and a receiving touchdown. “Until there’s no chance of us going to where we want to go, we’re always going to believe,” he said. It’s a good thing for Shurmur that someone was around to recite the company line. At 3-7, there’s still a lot of ground to make up. But in the NFC East, it’s not hopeless just yet.